Next Certificate offering begins August 5, 2019. Series begin in August and March. Contact us to inquire about enrollment for groups or teams of 10 or more. The Certificate in Early Education Leadership (CEEL), offered through the Zaentz Professional Learning Academy, is a visionary, job-embedded, online certificate program that supports the learning and development of early education leaders and provides them with the knowledge, skills, and tools needed to strengthen learning environments and foster quality improvement in all early education settings. Given the vital role high-quality early education plays in learning and development, early education leaders need a broad, cutting-edge knowledge base, relevant strategies, and leadership competencies to generate sustained quality improvement. The Zaentz Professional Learning Academy at the Harvard Graduate School of Education is offering a new Certificate in Early Education Leadership (CEEL) to provide leaders with the core knowledge, management skills, and tools necessary to build and advance high-quality early education across learning environments. Led by HGSE Professors Nonie Lesaux and Stephanie Jones, faculty directors of the Saul Zaentz Early Education Initiative, CEEL includes three series. Each series covers foundational knowledge, skills, and tools that enable early education leaders to improve and sustain high-quality early education for the learners they serve. Each series contains five modules. 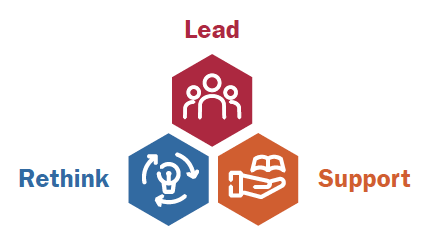 Four of these are instructional Learn modules that build participants’ core knowledge in key areas, including early learning and development, adult learning, and leadership and management. The fifth module in each series, the Plan and Apply module, is designed to support participants as they map key learnings and to create and implement a plan tailored to their site and work. Learn modules within each series can be taken individually, or as part of the series. Participants may complete the Plan and Apply module in a series after completing all four relevant Learn modules. Those who complete all 15 modules in the three series will earn the Certificate in Early Education Leadership. "The CEEL program has been a top professional opportunity for us. It fills a void in leadership training in the complex early education field. The chance to connect with leaders from across the globe and share insights on innovation paired with the research-driven modules has made a great impact in implementation. The readings, videos, and resources are uniquely curated to optimize our understanding and have given us rare connections to latest understandings in the field. We are better prepared to take on the daily challenges, and really shape our vision for improving the quality of early childhood programs." CEEL is designed to offer working professionals in early education an opportunity to deepen their core knowledge, enhance their skills, and add to their leadership toolkit through a flexible, online, and job-embedded learning experience. Materials are interactive and case-based. Each Learn module includes: brief video lectures from Professors Lesaux and Jones that include insights from current scientific research in early education and related leadership strategies and practices; readings; self-reflection exercises; online discussions; animated depictions of real scenarios drawn from early education practice; facilitated cohort discussions; strategies for practical implementation; and job-embedded practice to apply the concepts and techniques learned. Each Learn module runs for three weeks and requires approximately 10 hours of work. The Plan and Apply module runs for four weeks and requires approximately 15 hours of work. Upon completion of all four Learn modules, you will receive an invitation to apply to this final module, or you may register for a Series or the full Certificate in its entirety. ​Participants can register for the full Certificate, a Series in its entirety, or choose to complete the modules on an individual basis. For participants who wish to register for modules on an individual basis, the fee for each module is $199. For participants who wish to register for a Series in its entirety, which includes the four Learn modules and the Plan and Apply, the fee is $895. For participants who wish to register for the full certificate, you will be invoiced series-by-series and the fee is $895 per series. Click here for the complete schedule of the next Certificate offering beginning August 5, 2019. The next Certificate offering begins in August 2019; click here for the full schedule. Series begin in August and March; click here for a schedule of upcoming modules. Stephanie Jones is the faculty co-chair of Promoting Young Children’s Language, Literacy, and Social-Emotional Competencies, the Certificate in Early Education Leadership (CEEL), The Science of Early Learning and Adversity, Managing Behavior: Alternatives to Early Childhood Suspensions and Expulsions, and Using Data to Improve Quality. Nonie Lesaux is the faculty chair of The Opportunity of Bilingualism and faculty co-chair of Promoting Young Children’s Language, Literacy, and Social-Emotional Competencies, the Certificate in Early Education Leadership (CEEL), The Science of Early Learning and Adversity, Managing Behavior: Alternatives to Early Childhood Suspensions and Expulsions, and Using Data to Improve Quality. For participants who register for the individual modules, payment is due by credit card and must be submitted prior to the start of the program. For participants who register for the full series or the certificate, payment or a purchase order must be received within 30 days of program registration, or upon receipt of the invoice if registration is within 30 days prior to the start of the program. While a purchase order confirms enrollment, an outstanding balance is maintained until payment is rendered. Please click here for more information on our on-campus and online refund and withdrawal policies. Note that VA benefits may not be used for participation in CEEL. Upon successful completion of an individual Learn module, participants will receive documentation of completion, as well as a letter confirming 10 clock hours awarded. Upon successful completion of a Plan and Apply module, participants will receive documentation of completion, as well as a letter confirming 15 clock hours awarded. Participants who successfully complete all three CEEL Series — Leading for Early Learning and Development, Rethinking Leadership in Early Education, and Supporting Optimal Teaching and Learning Environments — will receive the Certificate in Early Education Leadership.